Invert this moist cake while it's still warm to reveal an autumnal kaleidoscope of glistening, tart berries and sweet mandarin oranges. In a medium mixing bowl, whisk together flour, baking powder, ginger, cinnamon, baking soda and salt; set aside. Place 3 tablespoons butter in a 10x2-inch cast-iron or other heavy oven-going skillet. Place skillet in a 350 degrees F oven for 3 to 5 minutes or until butter is melted. Remove from oven and carefully tip skillet to coat the sides with butter. Leave oven on. Sprinkle brown sugar evenly over the bottom of the skillet. Arrange orange sections over the brown sugar. Top evenly with cranberries. In a large mixing bowl, whisk together eggs, yogurt, granulated sugar, the 6 tablespoons melted butter and the vanilla. Add flour mixture to egg mixture, one-third at a time, stirring just until combined after each addition. Spoon batter into skillet, spreading to cover fruit. Bake in the 350 degrees F oven for 35 to 40 minutes or until a toothpick inserted into center of cake comes out clean. Let cake cool for 3 to 4 minutes. Run a knife around the edge of cake to loosen. Carefully invert the cake onto a platter. 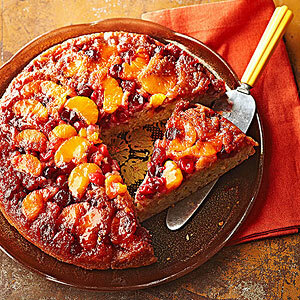 Replace any fruit that remains in pan. Serve warm or at room temperature. I love this flavor combination. The brown sugar tones down the puckery goodness of the cranberries and oranges. I tried it with sour cream and will try yogurt next time just to see the difference. It is great warm from the oven. Wonder what it would taste like with a scoop of orange sherbert on top...may have to give that a try. I'd love it if you added baking directions for a camp site. My son's Boy Scout troop would love these recipes, and they use cast-iron skillets (as well as dutch ovens) when camping.